I have been called to account for failing in The Inn's self-appointed task of alerting all and sundry to the approach of Friday the 13th. (Well, with the demise of Pogo someone had to.) And this month Friday the 13th fell particularly inauspiciously on a Friday. That was 4 days ago and your servant failed in his mission. No mention in The Inn. Even Homer nods and your servant isn't even Helen Steiner Rice. So apparently if you inadvertently walked under a black cat or broke a ladder or something and are now experiencing the requisite 7 years of bad luck, it's my fault. I do apologize. Looking on the bright side, though, you've only got 6 years, 11 months, and 13(!) days of bad luck left. A "less than ringing endorsement"
Unto the Council of Peebles shews your ser[vant] John Ritchie That whereas I have put my son to learn to play on the pipes to your piper he not being fit for other work, and I not being able to buy him a pair of pipes Beseeches your Honours to give me some small thing to the end fore[said]. The Council grants Warrant to their treasurer to give the petitioner John Ritchie five Shillings Ster for the use mentioned in the petition. 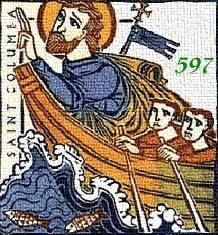 Today is the feast of St Columba or Colum Cille, if you prefer. He is on the liturgical calendars of Scotland and Ireland but he didn't quite make the cut in the United States. The Inn had this to say about St Columba a few years ago. The Catholic Encyclopædia has a detailed life here. Perhaps the best things on the web on St Columba can be found at the Trias Thaumaturga blog. You could start here but you don't have to stop there. A little searching reveals a lot more. Let us stress the words "He began to feel dread and to be exceedingly troubled," and "His sweat became as drops of blood running down upon the ground." It is the horror of the Redeemer before sin, not only before the Passion and death as such, but before the fact that all this must be endured in expiation for our sins, and that He was meant to take them upon Himself and be responsible for them. How terrible it must have been is shown by the other words He speaks in prayer: "Father, all things are possible to Thee. Remove this cup from me." What was to come went against the Redeemer's whole being; not only because death is a revolt against the will to live, but because sin is a revolt against God. His third exclamation is "Yet not what I will but what Thou willest." The Worst part of sin is its hiddenness. It hides everywhere: under the pretense that it is something natural, that it is something unavoidable, and that the power, gravity, or tragedy of life is expressed by it. If we are witnesses here of Christ's fate, our eyes are opened wide to this pretense. It's been 7 months on Youtube. Any answers yet? The hour of absinthe is over. We shall not be much further troubled with the little artists who found Dickens too sane for their sorrows and too clean for their delights. But we have a long way to travel before we get back to what Dickens meant; and the passage is along an English rambling road — a twisting road such as Mr. Pickwick travelled. But this at least is part of what he meant: that comradeship and serious joy are not interludes in our travel, but that rather our travels are interludes in comradeship and joy, which, through God, shall endure for ever. The inn does not point to the road: the road points to the inn. And all roads point at last to an ultimate inn, where we shall meet Dickens and all his characters. And when we drink again it shall be from the great flagons in the tavern at the end of the world. From GK Chesterton's Charles Dickens. At least, originally. I, however, have pilfered it shamelessly from the "Wit and Wisdom of G.K. Chesterton" site, which you can find here. You can follow that site on Twitter and never miss a bon mot from GKC. Are deep in the water, and frank, and fine. Not to excess, of course, but otherwise pretty much of a good thing all 'round. And if the Telegraph isn't good enough for you, how about the Minneapolis Star-Tribune? Yet another gold star for red wine but this time not focusing so much on resveratrol. These folks think the good stuff is, well, alcohol itself. I await anxiously the study on beer. Work to restore the medieval tower at Drum Castle, 12 miles west of Aberdeen on Royal Deeside, has revealed a secret chamber where a Jacobite hero of the Battle of Culloden hid out for three years . . . .
You can read the rest of the article here. Unfortunately, that's pretty much the most interesting part. A bit more about the Laird of Drum and his doings wouldn't have gone amiss.